Tram-train. It’s a concept first developed in Germany’s Karlsruhe more than a quarter-century ago that has subsequently spread to Kassel, Saarbrücken and most recently Chemnitz, and is now either in operation or planned – in various guises – around the world. However, until this point most cities that have adopted tram-train have ploughed their own furrow towards connecting railway and tram services. One result of this has been significant variation between systems. Another is that with the exception of Karlsruhe – which over the years has taken more than 200 vehicles – numbers, and orders, have tended to be small. Potential economies of scale through procuring and running larger fleets have not been maximised. Now being brought to life by the Verband Deutscher Verkehrsunternehmen (Association of German Transport Companies, or VDV) and explained to delegates at the recent EU Light Rail conference in Brussels (TAUT 967) is a project to develop a standardised VDV tram-train platform that could change all that. Specific variants would then be developed with features optimised for the needs of different cities with authorities effectively customising something that had already been certificated. Procurement costs could be brought down by around EUR1m per vehicle, from the EUR5m considered typical today. Although formally launched last year, initial discussions between operators in Karlsruhe, Kassel and Saarbrücken had started as far back as 2015. Lead partner is Karslruhe, through its 100% municipally-owned Albtal-Verkerhs-Gesellschaft (AVG) and Verkehrsbetriebe Karlsruhe (VBK) operators. It is intended to publish a formal Invitation to Tender in 2019, with the aim being for the first pre-series vehicles to be delivered the following year. That would then allow a trials and certification process to take place until 2023, with the first of the series deliveries planned for 2024. So, what would a ‘VDV’ tram-train look like? The intention is to include standardised car bodies, combined with a pallet of options on aspects such as how the vehicles are powered. As well as the ‘standard’ tramway 750V dc and ‘main line’ 15kV ac 16.7Hz power taken from overhead wires these options are to include diesel generators and accumulators, thus allowing wire-free operation. The specification foresees a 2.65m-wide and approximately 3.66m high vehicle with a maximum axle load of 10.7-11.5t and a wheel diameter not less than 680mm. The envisaged empty weight would be 63t, offering a maximum speed of 120km/h (75mph). The vehicles would be designed for one-person operation, with self-dispatch from stops. In terms of passenger capacity, it is intended to provide standing room for some 150 people, with either 84 seats (plus seven fold-down versions), or 96 (plus four folding). Body construction would be from steel, with crashworthiness meeting DIN EN 15227 level C3. Certification is to follow Germany’s EBO (railway) and BoStrab (tramway) regulations. Taking such an approach should mean that the homologation process will only have to be followed once; variants to the ‘standard’ will then be introduced under the principle of conformity with the original. 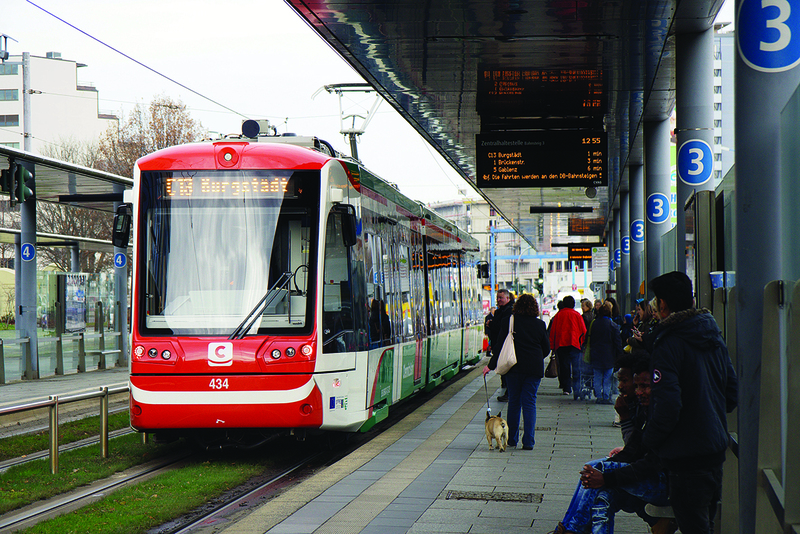 This provides a potentially significant contrast with the current situation, where those cities with tram-trains use a variety of vehicles to different manufacturers’ designs: just within Germany, Kassel has the Alstom RegioTram, Chemnitz chose Stadler’s Citylink, Norhausen uses the diesel-electric Combino Duo and Karlsruhe uses vehicles from a variety of builders, including Vossloh-Kiepe (now Stadler), Bombardier and Siemens. Elsewhere in Europe, Stadler is now one of the leading suppliers, with Citylink vehicles in service in Spain, the UK and Hungary. Already, the potential has been identified for 295 vehicles across the partners that are already involved: Chemnitz, RTW/Frankfurt (Main), Karlsruhe, Kassel, Mühlkreis (Austria), Saarbrücken and ENAG/Tübingen. Variants for the Saarbahn (Saarbrücken and surroundings), AVG (Karlsruhe area) and Verkehrsverbund Mittelsachsen (Chemnitz) have been 100% decided upon, with those for other partners still under discussion. A combined order or set of orders could therefore be a major prize for any successfully-bidding manufacturer. VDV’s ‘umbrella’ approach is also expected to bring operational benefits, particularly around minimising whole-life cost. Opportunities include the potential for the joint procurement of parts; shared workshop facilities and obsolescence management; and having a combined vehicle reserve. Such benefits – and savings – could last for decades. Karlsruhe leads, the world follows? Given how Karlsruhe’s operation already dominates the tram-train scene through its sheer size, it is perhaps no surprise that most envisaged orders come for that city – either through VBK or AVG. That being the case, you might think this south-west German population centre could achieve most of the benefits listed, even without having to work with multiple partners. Nevertheless, it is still considered in Karlsruhe’s interests that a standardised model is adopted – and that such take-up may not necessarily come only from within the country that has so far most widely embraced tram-train technology. For while the VDV process currently only involves German and Austrian operators, the fact that the vehicles will be designed under EU regulations, plus the reciprocal recognition of acceptance procedures, means certification in other countries is expected to be simpler than would otherwise be the case. So, for example, a sub-type could be produced for France or Sweden; that would then form the basis of further variants developed for networks within that country. Developments such as this would be welcomed by the project team, which has specifically said it is interested in attracting more partners from across Europe. It is perhaps also worth considering that this approach could bring benefits not only to those cities that are already committed or likely to commit to tram-train. For if the VDV scheme is successful in bringing down vehicle procurement costs and simplifying the process by providing a ‘go to’ design, might other authorities that would otherwise be unlikely to adopt the mode decide it is a good idea? Could, in fact, VDV’s project end up producing a set of vehicles that is to the tram-train mode what the PCC became for tramways?